Kuroto Dan certainly has some longevity to him eh? Bucking trends in Bandais collector toyline, the mighty self proclaimed God Kamen Rider GenM has a new Figuart on the way, S.H. Figuarys Kamen Rider GenM God Maximum Gamer Level Billion! This unique situation means that GenM’s final form power up, a repaint of Ex-Aids penultimate Level 99 form, will actually be released before the original! GenM Level Billion has been confirmed for a September 2018 release as a Tamashii Web Exlcusive for 9936 yen. I am and when Ex-Aid Level 99 is also officially announced for release, we’ll be sure to update you. For now, be on the lookout for a set of official photos for Level Billion! The original source for this news comes way of a flyer posted by @LS04_Melon on twitter. Tamashii Nations’ Akiba Showroom recently updated it’s displays, and among them is a brand new figure as well as a few returning faces from previous events! First up is the first appearance of S.H. Figuarts Kamen Rider Grease, who like his fellow Sclash Driver user Cross-X charge utilises translucent plastic parts on the face and chest. There is no release date information for the Kamen Rider Build character as of yet, however at the time of writing it is being reported as a Tamashii web exclusive. Next up are two more figures from Kamen Rider Ex-Aid – Kamen Rider Cronus and Kamen Rider Genm God Maximum Gamer Level 1000000000. These figures have been seen at previous Tamashii events, and although Genm is a repaint of the (currently unreleased) Kamen Rider Ex-Aid Maximum Gamer Level 99 figure it’s reappearance here has been well-timed with the release of the Kamen Rider Ex-Aid: Another Ending V-Cinema trilogy in which it debuts. 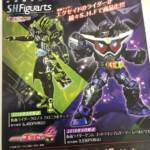 Again, neither of these figures currently have release dates but Cronus is being reported as a web exclusive. Check out the full-sized images after the jump and we’ll bring you more information on these figures as it comes! 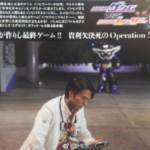 Shin Dan Kuroto returns yet again with another new form for S.H. Figuarts! Revealed last month, we now have full official images and release info for S.H. Figuarts Kamen Rider GenM Action Gamer Level 0! GenM Level 0 reuses the popular Ex-Aid Level 2 body once again, and this go around comes with a couple new accessories that are must haves for Kuroto. The Gashacon Breaker Sword, the Bugvisor Zwei, a remaining Life Counter, and even a Shin Dan Kuroto effect sheet! This is a must have for fans of the Gamer Master himself. S.H. Figuarts Kamen Rider GenM Action Gamer Level 0 will be released in July for 6264 yen as a Tamashii Web Exclusive. Shin Dan Kuroto finally arrived with a brand new reveal, S.H. Figuarts Kamen Rider GenM Action Gamer Level 0! Revealed via Figure Oh scans currently making the rounds (by way of @TendouToys on Twitter) GenM Level 0 is another figure that fans of Kamen Rider Ex-Aid have been hoping for. Scheduled for release in July 2018, GenM Level 0 is a Tamashii Web Exclusive and retails for 6264 yen. Official images should be released for this figure in the near future. We’ll be sure to keep you in the loop when they drop! Kamen Rider Ex-Aid Another Ending Part 3 Teaser Trailer Now Online! A brief teaser for the third and final installment in the Kamen Rider Ex-Aid: Another Ending movie series has been posted online! This last outing sees Kamen Rider Genm against Kamen Rider Lazer once again, for control of the GOD MAXIMUM MIGHTY X Gashat. Ex-Aid Another Ending Part 3 is currently scheduled for release on April 25, 2018! Toku Toy Box takes a look at the Game Master once again! After Level X last time, now we have the opportunity to checkout Kuroto Dan’s excellent, and recently release Level 2 form with S.H. Figuarts Kamen Rider GenM Action Gamer Level 2! 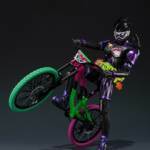 And since this is the Tamashii Nations 2017 event exclusive version of the figure, we also get to share a look at the fantastic Shakariki Sports bike included with this release! GenM Level 2 is a straight up repaint of the still fantastic Ex-Aid body type, done up in GenM’s gorgeous trademark purple and black. Separating itself from the Ex-Aid release though, GenM includes parts to recreate both versions of his handheld weapon the Gashacon Bug Visor. And since this is the event exclusive, this version also comes with a wonderfully detailed and excellently done Shakariki Sports bike with its own wheel base for display. If you’re waiting it out to get the Web Exclusive release of this figure next year, you may regret it as it won’t include the bike. We’ve attached the full 99 image gallery to this post, but you can see all the images as well as read our comprehensive review of this figure by clicking “Discuss on the TokuNation Forums” at the bottom of this post. We’ll be back soon with a blast from the past with a brand new gallery from Ultra Seven! The data of death. Using this invaluable information, Kuroto Dan was able to achieve the unthinkable and defeat mortality. As the embodiment of the Dangerous Zombie Gashat, Kuroto cemented himself as a true villain for a time. Unthinkable power and a new Level, this deadly combo spelled the end for one of our heroes at Kuroto’s hands. Now Bandai has spelled the end for our wallets by finally releasing one of the most hotly anticipated figures from Kamen Rider Ex-Aid. S.H. Figuarts Kamen Rider GenM Zombie Gamer Level X! GenM Level X is a design that is unquestionably unique and menacing, something that was ripe for potential as a toy. Despite the occasional miss from Bandai, I’m really happy to report that GenM is not. From the grounf up this figure is executed near flawlessly. Some paint issues aside, GenM fails to disappoint. Being able to maintain some really great contorted poses, coming with 5 sets of hands. 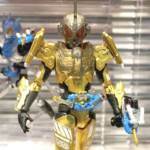 Even coming with the Gashacon Sparrow, his trophy from the defeat of Kamen Rider Lazer. This figure is a fantastic addition to an already well rounded selection of Ex-Aid releases. We’ve attached the full 70 image gallery of GenM Level X to this post, you can also check out our full length review of the figure by clicking “Discuss on the TokuNation Forums” at the bottom of this post. We’ll be back very soon with several new galleries for Toku Toy Box including some Mighty Brothers, a few vintage pieces, and a Chogokin or two! New Kamen Rider Ex-Aid Another Ending Forms Revealed! Some new images for the upcoming Kamen Rider Ex-Aid Another Ending film trilogy have surfaced online! *Now that the main battle against Chronus is over, Kuroto Dan sets out to launch his ultimate game project: ZOMBIE CHRONICLE! To aid in this goal, Dan has upgraded his powers yet again- creating Kamen Rider Genm God Gamer LVL Billion (a repaint of Ex-Aid’s own Maximum Gamer). 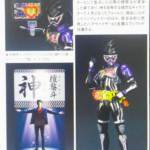 *Kiriya returns to action as well, using the Buggle Driver and henshin into a new BLUE version of Kamen Rider Lazer (which appears to be a repaint/reuse of the GiriGiri Chanbara LVL3 armor). Yet again it truly seems The Game Is Forever! Stay tuned to TokuNation as we keep you up to date on all Ex-Aid details! Tamashii Nations 2017 Exclusive Revealed: SH Figuarts Kamen Rider Genm & Shakariki Sports! A special exclusive figure for Tamashii Nations 2017 has been revealed- SH Figuarts Kamen Rider Genm! The LVL2 Rider comes with his Shakariki Sports neon bicycle but sadly it does not appear that the two figures are capable of combining to reach LVL3. Kamen Rider Genm can be purchased at Tamashii Nations for 5000 Yen. This figure (and other exclusives) will be made available via Premium Bandai at a later date- details are sadly unrevealed at time of writing. Stay tuned to TokuNation for further coverage of Tamashii Nations 2017! 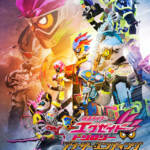 Kamen Rider Ex-Aid Hyper Battle Video & V-Cinema TRILOGY Announced! Looks like Toei ins’t ready to say GAME OVER just yet! A series of side projects featuring Kamen Rider Ex-Aid has been announced- beginning with a Hyper Battle Video and then leading into THREE unique V-Cinema projects! *Part 1 features Kamen Rider Brave & Kamen Rider Snipe, releasing on March 28 2018! *Part 2, focusing on Kamen Rider Para-DX & Kamen Rider Poppy is scheduled for April 11 2018! *Part 3, starring Kamen Rider Genm & Kamen Rider Lazer will debut on April 25 2018! Each film may have a limited theatrical release, but details have not been confirmed at time of writing. 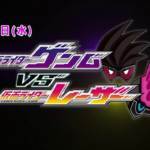 Meanwhile, the Kamen Rider Ex-Aid Hyper Battle Video will feature Emu challenging Genm’s newest game! Additional details will be revealed in the September 2017 issue of Terebi-Kun Magazine so stay tuned to TokuNation as we keep you up to date on this & all Kamen Rider Ex-Aid projects!